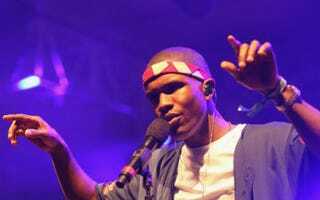 In a piece for the Huffington Post, Esther Armah argues that Frank Ocean's revelation that he had a relationship with another man is a sign that black people are shedding the "narrow straitjacket that is conventional masculinity." Frank's love letter was a display of freedom, a call to action for all men. Our association with emotionality and homosexuality is hardly new and still complicated. This becomes a moment to have an intimate public conversation around our notions of masculinity. That conversation is tied to legacies of racism, notions of gender (and the threat of crossing gender boundaries), and rigid ideas of patriarchy. It's problematic, painful and needs interrogation. Reaction to Frank was broad and swift. Conviction and execution on Twitter was matched by Twitter justice in support. MSNBC's Melissa Harris Perry spoke to author and public intellectual Michael Eric Dyson. The New York Times featured pieces that quoted the voices of some of hip hop's great cultural critics including activist scholar and author Mark Anthony Neal, hip-hop feminist cultural critic Joan Morgan, film-maker Nelson George. They all spoke to a social shift that meant Frank would not mourn the death of a career at his own truth-telling hands as he might have done had this happened 5, 10, or 15 years earlier. The brilliant writer dream hampton captured the significance of Frank's action as she languaged his revelation in these contexts: today's media, the lack of real risk and low stakes for the white privileged world of CNN anchor Anderson Cooper versus the high stakes, high risk world of hyper-masculine hip-hop out of which came Frank Ocean and, for me, most importantly, within the powerful seat of love, loss, legacy and learning. Read Esther Armah's entire piece at the Huffington Post.